The division was created following the 1983 redistribution. It was named after ‘Araluen’, the residence of the late EJ Connellan whose homestead was on the west side of town. It is believed to be an Aboriginal name meaning ‘the place of lagoons and water lilies and running water’. In the 2015 redistribution Araluen gained part of the suburb of Araluen from the Division of Braitling; Desert Springs and parts of East side, Mount Johns and Sadadden from Greatorex. Araluen lost rural areas south of Heavitree Gap to the Division of Namatjira. 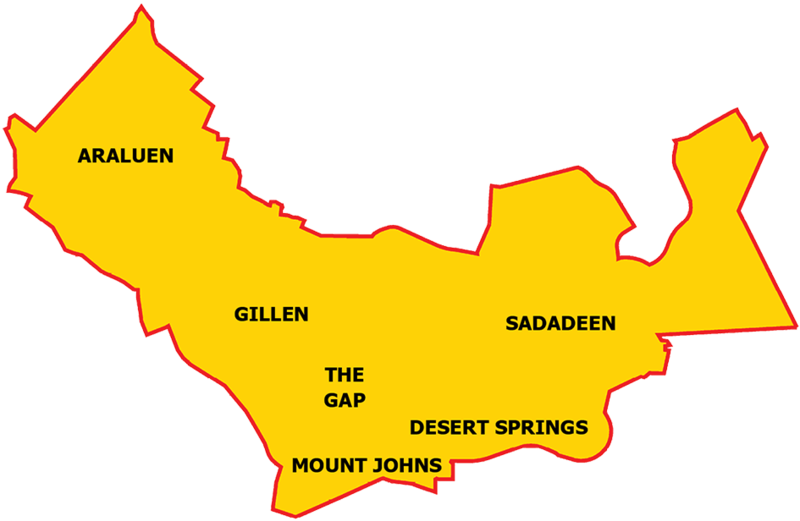 This division includes the south-west Alice Springs suburbs of Araluen, Desert Springs, The Gap, Gillen, Mount Johns and Sadadeen.